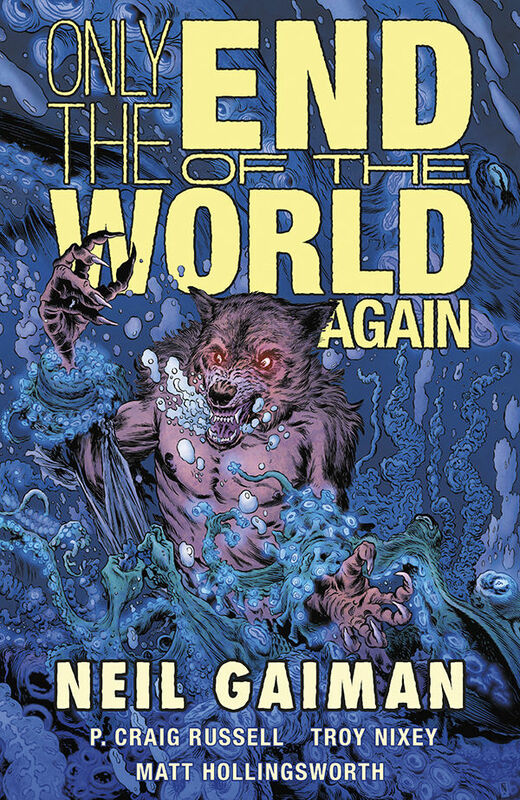 Dark Horse Comics recently announced plans to release a new deluxe hardcover edition of Neil Gaiman’s, Only the End of the World Again, adapted by P. Craig Russell, Troy Nixey, and Matthew Hollingsworth. Only the End of the World Again blends the worlds of H.P. Lovecraft and Roger Zelazny. The story follows a claims adjuster who sets up shop in Innsmouth, Massachusetts only to discover that the world may be ending and that the instrument of destruction is a werewolf . . . which he also happens to be. Only the End of the World is based on a short story written by Neil Gaiman (American Gods, Sandman). This new edition is adapted to comics by P. Craig Russell (American Gods: Shadows, The Graveyard Book), illustrated by Troy Nixey (The Black Sinister, Jenny Finn), and colored for the collection by Matthew Hollingsworth (Wytches, Tokyo Ghost). This new hardcover edition features a brand new cover by Troy Nixey and Matthew Hollingsworth with bonus material including high-resolution scans of the inks and layouts. This is the latest offering from the expanding Neil Gaiman Library at Dark Horse, which also includes Forbidden Brides, Troll Bridge, and How to Talk to Girls at Parties. Only the End of the World Again is set for release at comic stores on January 24, 2018.